Q: Is there a deductible that I need to pay when making a claim? A: There is no deductible on the program. All parts and labor are covered 100%. Q: Can I perform my own maintenance? A: No. All services must be performed by a professional repair facility. This is to ensure proper documentation as well as the workmanship of all services performed on your RV. Q: When are claims specialists available to take my call? A: Claim specialists are available Monday - Saturday to answer all of your questions. Just call our dealership. Q: What if I experience a breakdown while traveling out-of-town? A: You may take your RV to any professional repair facility. 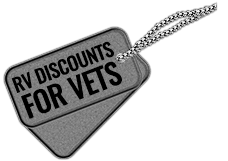 You may contact 1-800-810-8458 for additional assistance or call our dealership. 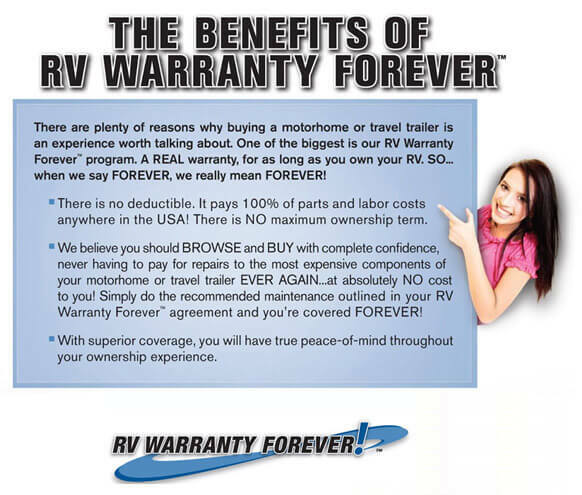 Q: How do I know what maintenance is required to keep my RV Warranty Forever agreement in force? A: Simply follow the maintenance requirements outlined in your RV Warranty Forever agreement. If you have any additional questions, please contact our dealership. Q: Why do I have to follow the maintenance guidelines outlined in my RV Warranty Forever agreement? A: Proper maintenance is the best preventative measure in reducing future breakdowns. Your RV is less likely to experience a breakdown if it is being properly maintained. Q: How do I make a claim in the event I experience a breakdown? A: Take your RV to any professional RV repair facility and provide them with a copy of your RV Warranty Forever agreement. They will handle it from there. If you have any questions that you would like to ask us directly, you may call our dealership. 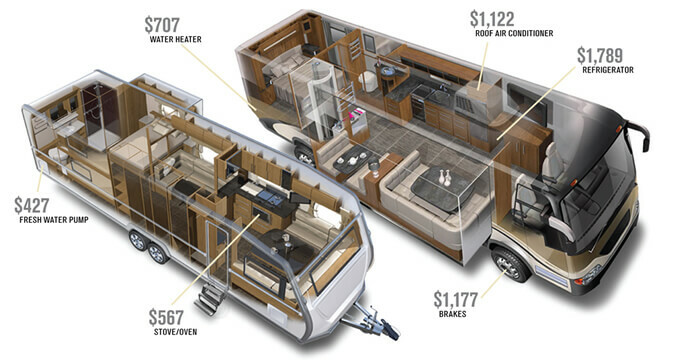 Many customers wonder about the type of components under the RV Warranty Forever™ program. For complete details on the components covered, check out the details below! Notice: Towing and roadside assistance expenses are not covered under the Warranty Forever program.